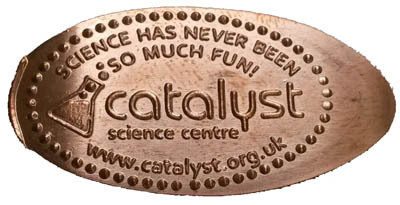 Catalyst is an interactive science centre whose aim is to make science exciting and accessible to people of all ages and abilities. Find out how the products of chemistry are used in everyday life - from medicines to Meccano (a model construction system invented in the UK) and learn about the chemistry industry and its role in our lives, past, present and future. There is a new Scotron Single Die electric machine in the shop, next to the tills. It costs £1 to roll. 1) Catalyst Logo with a Conical Flask. Science has never been so much fun. text. Dotted border. thegillion added Catalyst Chemical Science Discovery Centre to system.